Ambiguity of many potentially unwanted applications makes it hard to decide whether they are real security threats or not. However, if you have something like iWebar installed on your system, it is for the best to remove this adware application. The main reason why iWebar seems to be suspicious is because it gets installed on your computer silently – you are not prompted about the oncoming system changes. Thus, although it is possible to remove iWebar manually, you should also scan your computer with SpyHunter free scanner after manual removal to ensure that the PC is absolutely safe and clean. iWebar is also slightly ambiguous, because it would seem that the application has been created to improve your online search experience. The main promotional tagline for iWebar at iwebar.com reads: “Fine exactly what you’re looking for from any page you are on”. In a sense iWebar should function as a custom search bar although technically, you could achieve the same results with Ctrl+F function on basically any browser. However, even though iWebar is promoted as a useful browser add-on, it is not possible to download it at the main homepage, because the download link is dead. It also means that iWebar is distributed bundled with freeware. Since this application is published by Goobzo, most of the programs that iWebar comes bundled with are Goobzo apps as well. For example, iWebar may arrive at your computer together with Sense Adware, YTDownloader, YouTube Accelerator, Jollywallet and so on. Whenever you install freeware application that brings iWebar onto your PC, the additional program is setup without your permission. iWebar gets installed as an add-on on Internet Explorer, Google Chrome and Mozilla Firefox web browsers. It functions just like Lyrics adware in a sense that the application collects data on your web browsing habits and then generates pop-ups and other types of ads. 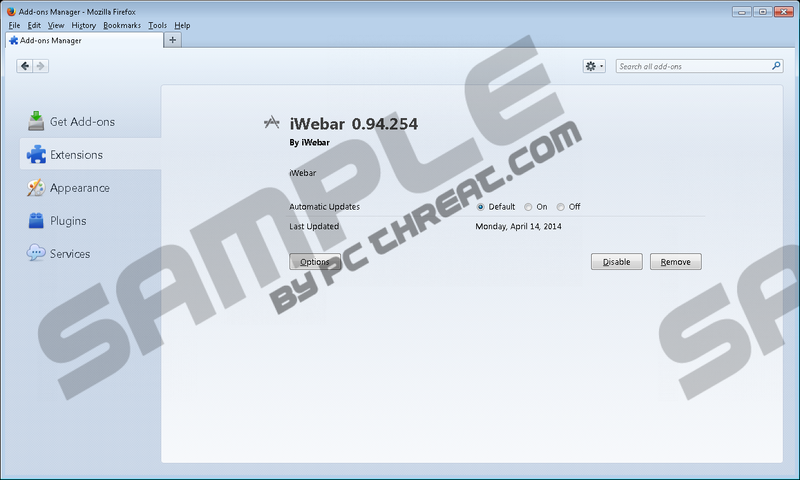 Thus, it is obvious that not only does iWebar NOT do what it is supposed to – it does not add a toolbar to your browser, but it also exposes you to potentially malicious content. It may also be that iWebar makes use of a known product name to sound more reliable to unsuspecting computer users. However, any program that is installed on your computer without your permission should not be allowed to remain in the system. Hence, access Control Panel right now and remove iWebar from your computer along with other Goobzo applications. In case you do not know which programs are potentially unwanted, scan your PC with licensed antimalware tool. It may also be a good idea to invest in a computer security product that would safeguard your system against similar threats. Select Uninstall a program and remove iWebar. Open Uninstall a program and remove iWebar. Select Add or remove programs and uninstall iWebar. Should you have any further questions on iWebar’s removal or your computer security in general, please feel free to contact us by leaving a comment below. Quick & tested solution for iWebar removal.